Wants to be L.A. Confidential meets The Untouchables, but ends up more like a goofier version of Mullholland Falls. It’s very simple. this movie has been done before. L.A.. Confidential, American Gangster, The Untouchables, Heat, Mulholland Falls, the list goes on and on. and this movie is possibly the worst of the bunch. That’s because it has nothing new to offer and doesn’t even try. the dialogue is lousy, the storyline is cliched, and even the action isn’t anything special. To be fair, the movie is watchable, and it does hold our attention. That’s probably due to the likeable cast and fun set pieces. but boy are there a lot of missed opportunities here and a lot of wasted talent that could have been in a much better film. 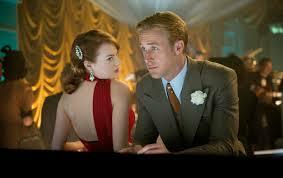 Gangster Squad is an alright movie that is a lot of noise with not a lot of substance. Sure it’s got a fine cast, but the actors are only as good as the movie, and the movie is only as good as the story. Here, the story is lacking. It’s a simple plot line about cops taking on criminals. There’s no mystery or creativity in any way, and the worst part is, we’ve seen this done again and again, and it’s just about always better than this. 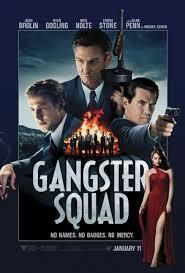 There are lots of problems with Gangster Squad, but most of them are easy to look past and not get hung up on. For example, the movie is a little goofy, but so what? It includes one-dimensional characters, often stupid voices they are using, and some pretty terrible dialgogue. but by some miracle, none of that takes you out of the movie. the main problem is simply that everything in this movie is something that we’ve seen before. there are just no surprises here. there is nothing original, or fresh, or creative. if a movie can’t offer anything new, then there’s really no point of making it. like other, better films, such us l.a. confidential and the untouchables, this is the movie of a police team made up of rogue cops who are going outside the law. they are basically turned into vigilates working together. the only new line in this movie, that we haven’t heard before somewhere else, is “leave the badges at home.” otherwise, there isn’t a single bit of new dialogue or any angle that makes this movie unique. we’ve even seen this type of movie, set in the exact same time period before. Brolin plays the leader of the group. he’s the guy who is basically doing the same thing at the start of the film that he will later on be doing with a group of teammates. he’s going at it on his own at the start, busting into places that are owned by mickey cohen (sean penn), and doing what he thinks is right. at the start of the movie a girl is kidnapped and is about to be raped by some of these gangsters when brolin’s character, sgt. john o’mara shows up to save her. the movie falls right in with the usual cliches, including having a police chief who gives o’mara hell and tells him to stay away from cohen’s business establishments. cohen is the head gangster in l.a. and he’s got everybody bought off. there are scenes of him sitting at dinner with judges, having the world at his fingertips. it would have been nice if the cohen character was given a little more story or personality. a much better movie would have presented a little about how cohen got to be where he was in the business. in this film, whatever back story there is about cohen is handled with one dismissive throw-away line. it is nolte’s character who calls in o’mara and tells him the only way to take down cohen is to go at him head on and forget about the law. that’s when o’mara starts putting his team together. somehow in minutes his wife goes from being angry and against the whole idea to helping o’mara pick out which men should be recruited. he goes to see each one, including robert patrick and michael pena, and before long, he’s got a team. considering that this movie wanted to be like every other similar film that came before it, the smart move would have been to study those films and realize what they did right. from american gangster to heat, there is just so much to choose from and use, that it’s kind of embarrassing this movie fell so short of the mark. there is a chinatown scene, for example, that should have been incredible. the setting was certainly there, and so was the setup, where cohen and his men knew the cops were going to be there. with all that going on, somehow this movie managed to screw it up. there’s a strategically placed explosion that goes off, and yet does absolutely no damage to any of the characters. despite the villains knowing our heroes will be there, none of them gets killed. at most, anthony mackie takes a shot or two and keeps going. the gunfight in the street scene in heat would not have been the same without any real death. but this movie goes for the easy copying, so instead of improving on anything, we get a little tribute to the odessa steps sequence (first in battleship potemkin and then used for gangster shootouts in the untouchables), with characters firing from both levels of a giant staircase. none of the action is impressive and that’s another problem with the movie. so is the fact that characters like ryan goslings and emma stones think they can see each other behind cohen’s back (he is the boyfriend of the stone character), and that nothing will happen to them. and nothing does. ridiculous. the movie is definitely watchable and not cringe inducing or anything like that, but it also offers absolutely nothing new to the genre.